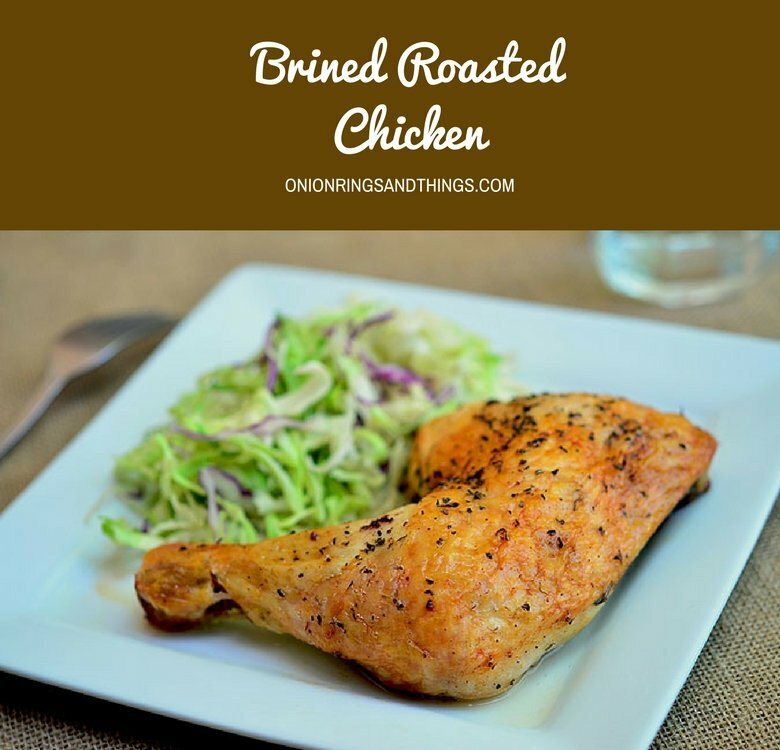 Brined Roasted Chicken is your answer to dry, flavorless meat! 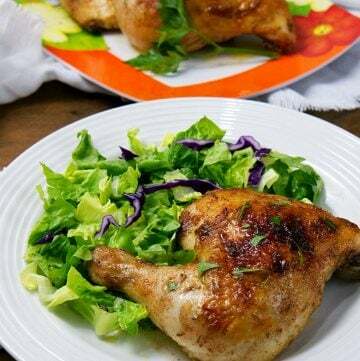 Super moist and flavorful, this roasted chicken is easy to make and perfect with your favorite sides. 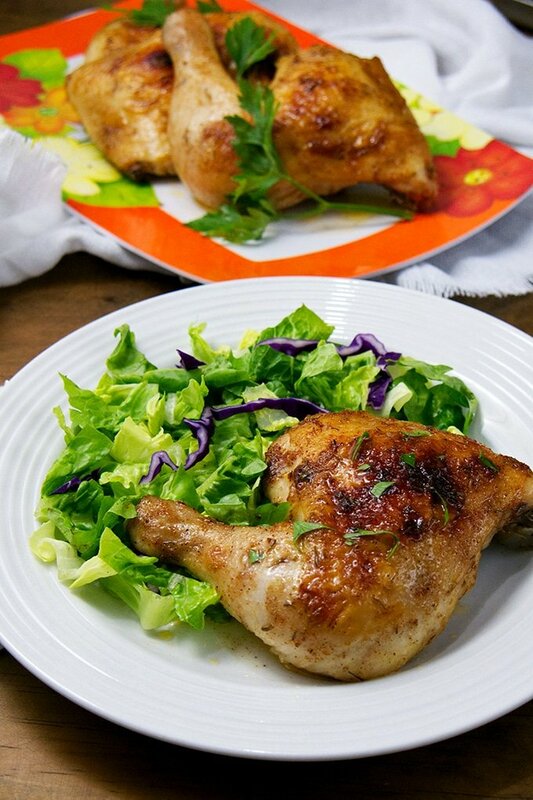 I love chicken and given a choice, I almost always would choose it over beef or pork. But sometimes, the fine line between my risking salmonella and chewing something like sawdust is a hard spot to find. The answer to dry, flavorless meat? Brining! 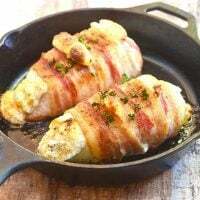 Chicken and other types of meat with less fat such as turkey and pork may benefit from this method as the process permeates the meat with flavor and traps in the natural juices during cooking. An hour in a saltwater solution before going into the oven, these brined chicken pieces come out super juicy and tasty. The basic chicken brine recipe below is a great starting point which you can customize with herbs and aromatics as you like. Garlic cloves, peppercorns, bay leaves, sage, thyme, rosemary, and allspice berries are but a few of the savory choices you can experiment with. Use cool water and store the turkey and the brine in the refrigerator to ensure food safety. Monitor the temperature of the liquid to make sure it’s below 40 F.
Use a deep, non-reactive pot or container and enough brine to keep the turkey completely submerged during the brining process. Use a heavy plate or bowl to weight down the meat in the solution and to keep from floating. Drain the chicken from the brine and discard the liquid. Do NOT reuse the salt solution! Rinse the chicken well under cold running water to remove excess salt and pat dry. You can season the leg quarters with the dry rub in the recipe below or use your favorite spice blends. Note that the chicken has already sat in a salt solution so you might want to add salt if even, sparingly. Use a roasting rack and arrange the chicken in a single layer to ensure air circulation and help the chicken crisp up in the oven. The curing process will cause a tinge of pink in the meat; it’s best to use a meat thermometer to properly gauge doneness. Insert the thermometer into the thickest part, making sure the probe doesn’t touch the bone. 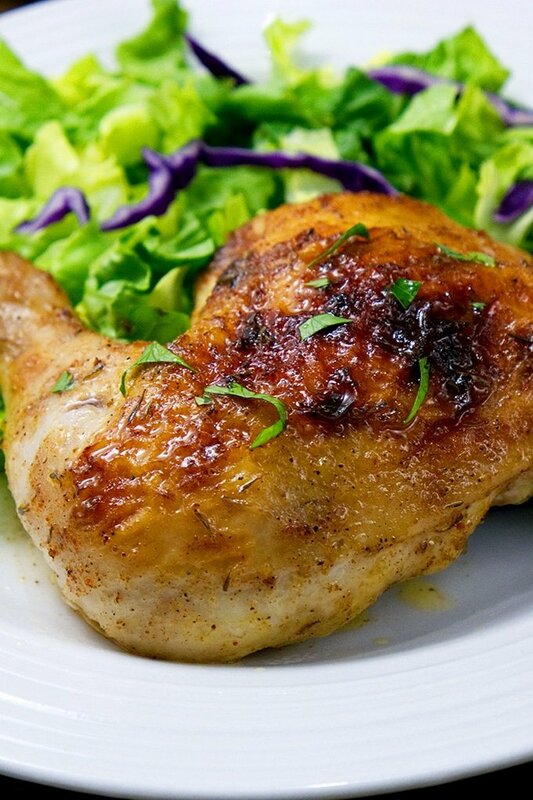 If the internal temperature is 165 F, your chicken is ready to enjoy! 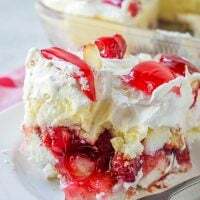 In a deep container, combine cool water, salt, and sugar. Stir until sugar and salt are dissolved. Wash chicken and pat dry. Add chicken pieces to brine mixture and refrigerate for about 1 hour. Drain chicken from brine and rinse well. Pat dry. In a small bowl, combine butter, garlic powder, paprika, pepper, and thyme. 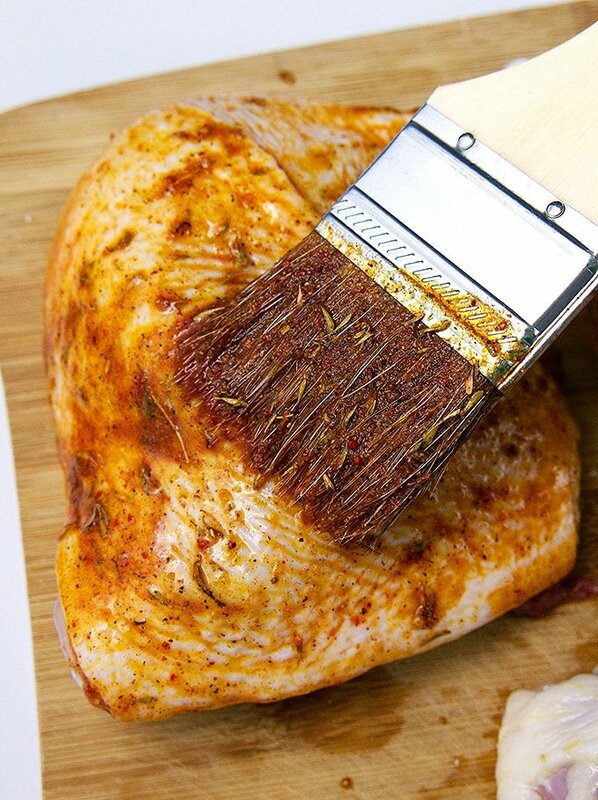 Brush mixture on all sides of chicken. 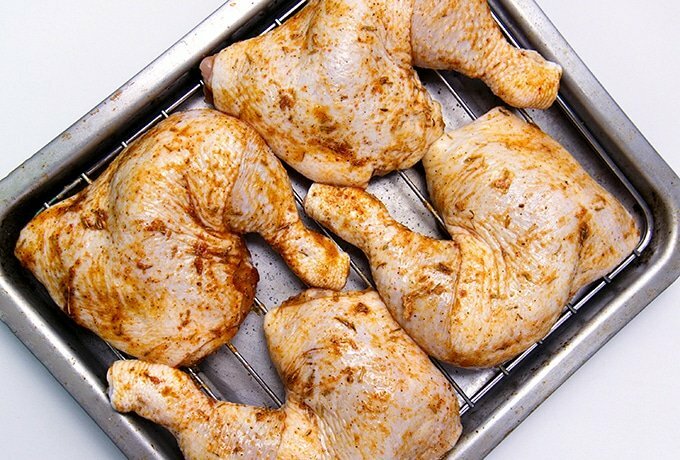 On a roasting pan, arrange chicken skin side up in a single layer and roast in a 425 F oven for about 35 to 45 minutes or until thermometer inserted in the thickest part reads 165 F.
Could you please fix the brine section. The solution doesn’t make sense to the details. You mentioned apple juice in the details (twice), but no apple juice is mentioned in the solution. Thanks! Thank you so much! 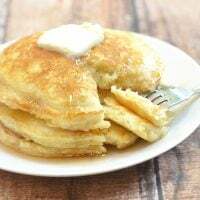 I corrected the recipe. 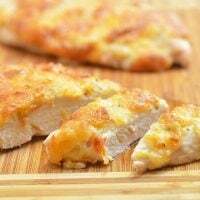 I used a buttermilk brine for some fresh skin-on, bone-in chicken breasts a few weeks ago and it was divine! That one was left to soak over-night though. Is an hour long enough? or does juice permeate the meat more quickly? I may just have to do some experimenting. =) Thanks for the inspiration.